Steven met the other day with Jonathan Thompson from sunsationalsolutions.com to pick out the film. Jay arrived today to install it. 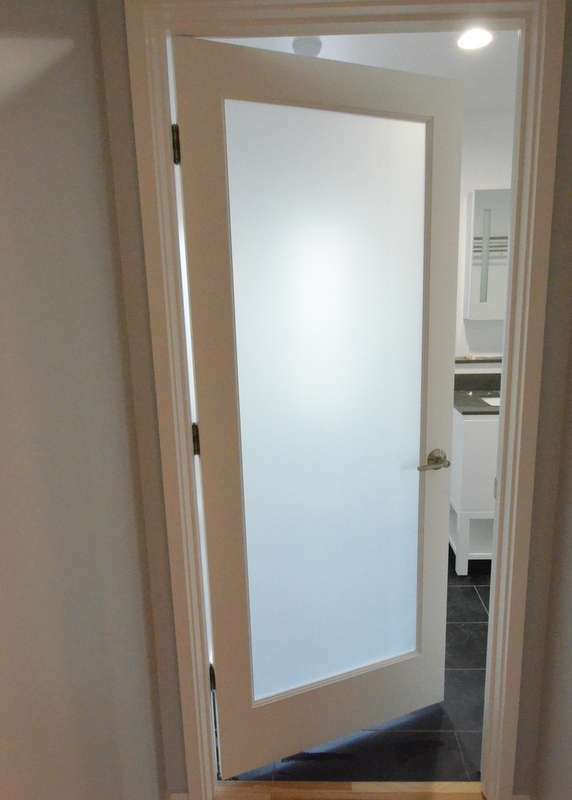 The door to the master bath after Jay finished installing the film — opaque, no longer clear. We bit the bullet and also installed film at the glass door to Steven’s office. And to the window in Jadin’s bathroom. 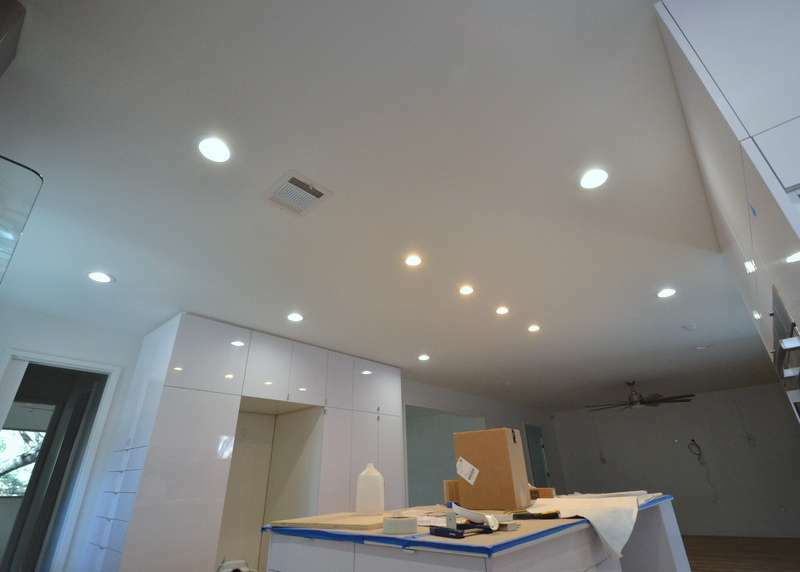 Team Ranserve continue working through the punch list as we count down to moving in. Odell called for the Final Inspection. The inspector arrived. Emerald Hill failed. As expected. This inspector is new to the remodel. 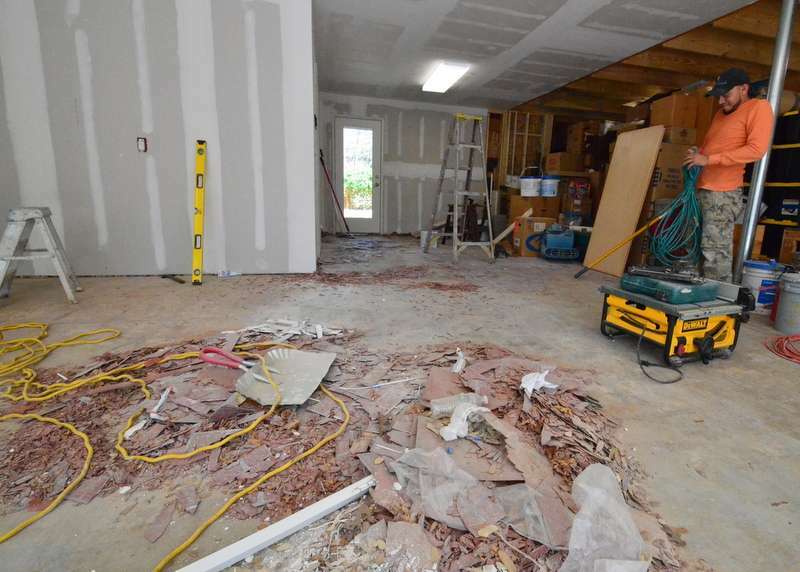 He requires more documentation of where the two layers of fire-resistant drywall are and are not installed in the garage, around the mudroom. 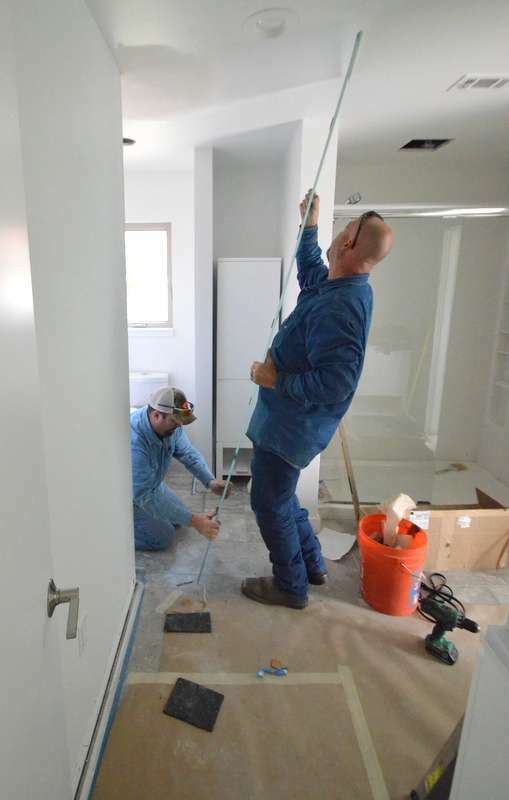 The previous inspector approved two layers around the mudroom and one layer on the walls that do not connect with the body of the house. Odell is attempting to contact that previous inspector for clarification and resolution. Above, Julian test fits the 12×12 sheets of 2×2 black tiles that will become the final floor of the master shower. This is how we resolve an issue that has festered since November, when the shower floor was first tiled. 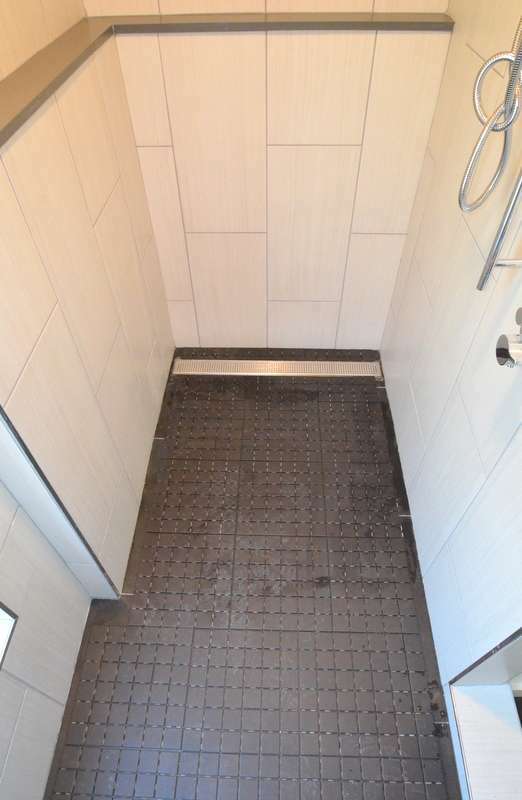 The grout lines do not line up. Jacquela objected — the first issue she ever raised on this project. Julian laid out the mosaics. Jacquela arrived to inspect. She approved. Julian is five sheets of tile short. 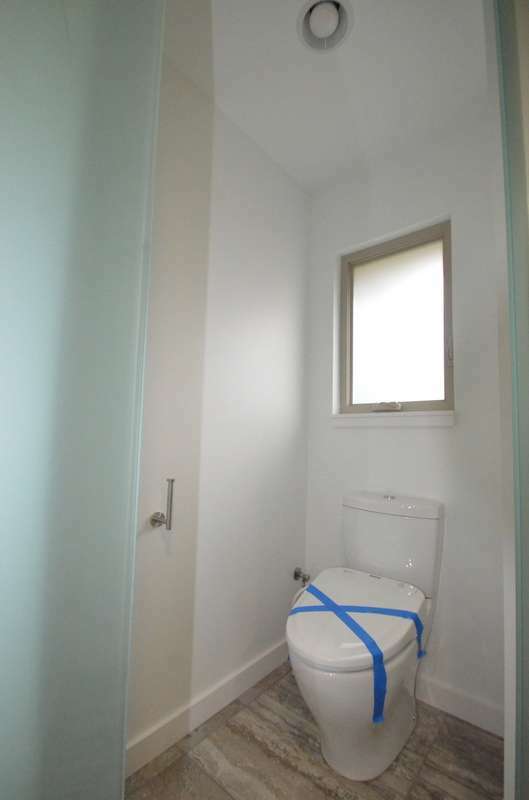 Odell ordered the tile. 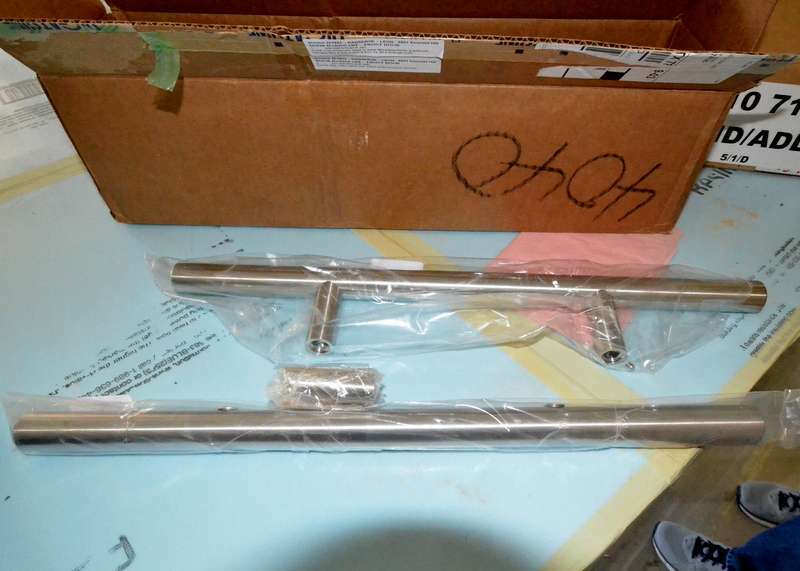 Now we wait for delivery and install. Thisi s a mock-up of what the floor will look like when done. Julian left the border on each side open, dry fitting the tile for full sheets to calculate how many more tiles he needs and how much cutting will be required. 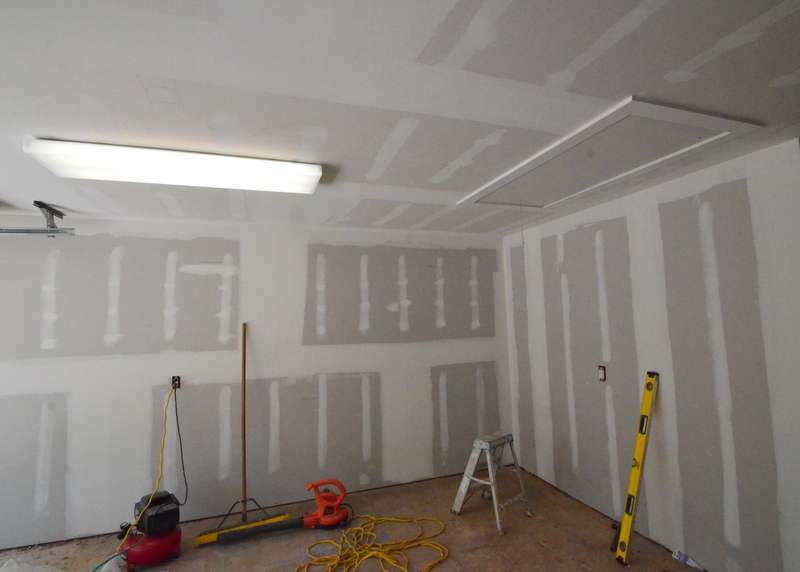 In the garage, Odell remounted the fluorescent ceiling lights — taken down to put up drywall required by the inspector — and the electricians wired them up again. Odell also trimmed out around the attic hatch. 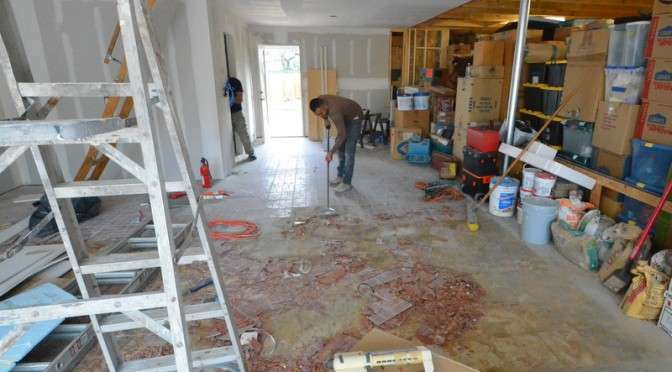 Jacinto is back for day 2 of scraping up the red linoleum tiles from the garage floor. He reports his shoulders shudder as he falls asleep — induced from hammering the scraper at the edge of each tile, prying it loose from the glue. Most of the tiles shatter into dried-out shards. Steven attempted to help yesterday. He got up two tiles in five minutes, with a new understanding of physical labor. 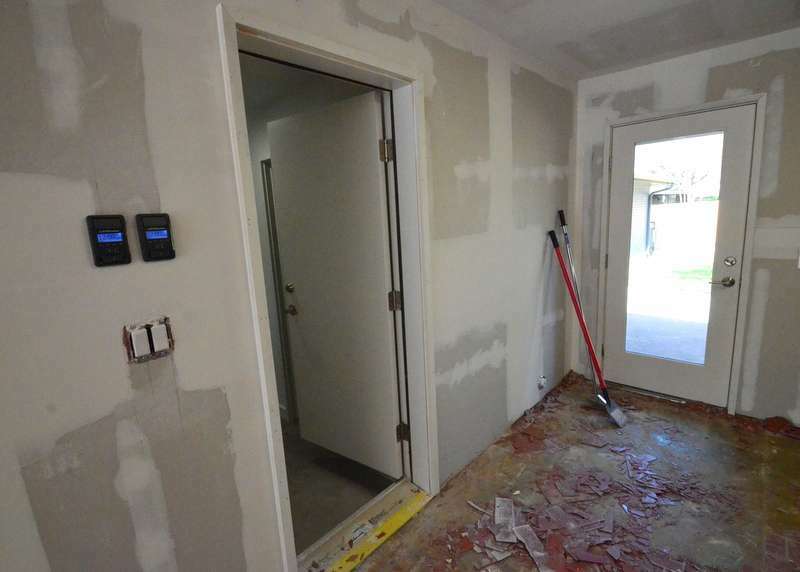 At the garage door into the mudroom, and around the door to the back yard, floating the drywall is completed and Odell trimmed out both doors to match the interior trim. He also mounted the garage door openers to the wall — they were hanging loose before this, waiting for the drywall work to finish. Inside the mudroom bath, the wall behind the sink is now patched — and Odell is again test fitting the drain line and T-trap. 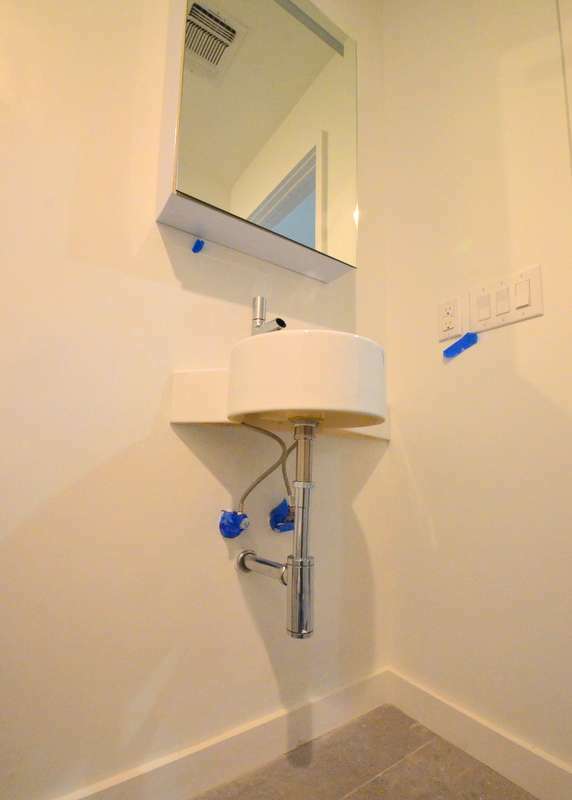 Upstairs in the master bath, Odell discovered that the left-hand medicine cabinet is not centered over the sink faucet; he will take it down and recenter it. He also ordered a replacement for one of the sink faucets, which seems to have developed a permanent slow leak via the cartridge. The port-a-potty was taken away five days ago. 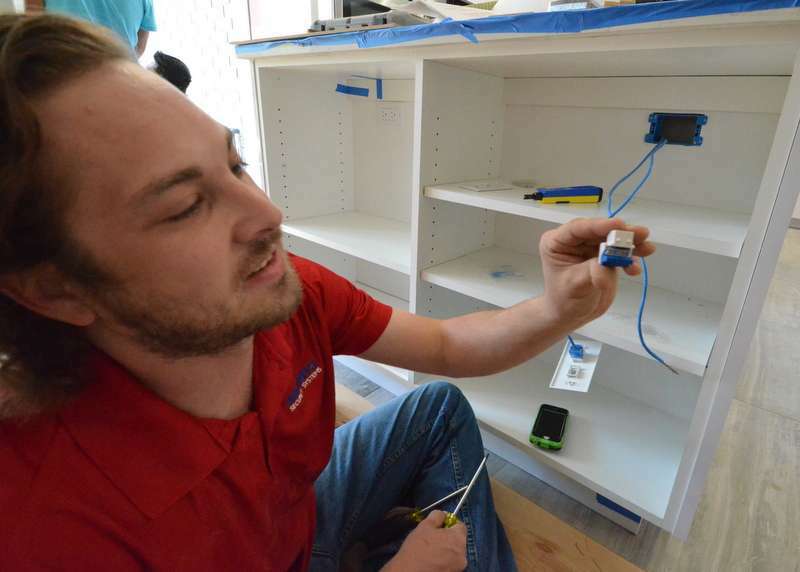 We’re 24 hours closer to moving in — and Team Ranserve is working through the punch list. Above … Jacinto from Ranserve today began to scrape the old linoleum tiles off the floor in the old garage. We suspect one of the previous owners converted the garage into a rec room. We want to park the cars and use the space for storage and tools. Catching up … the whole-house surge suppressor that the electricians installed a couple of days back — at the bottom of the electrical panel. Odell chiseled the door frames to fit the strike plates for the deadbolts. 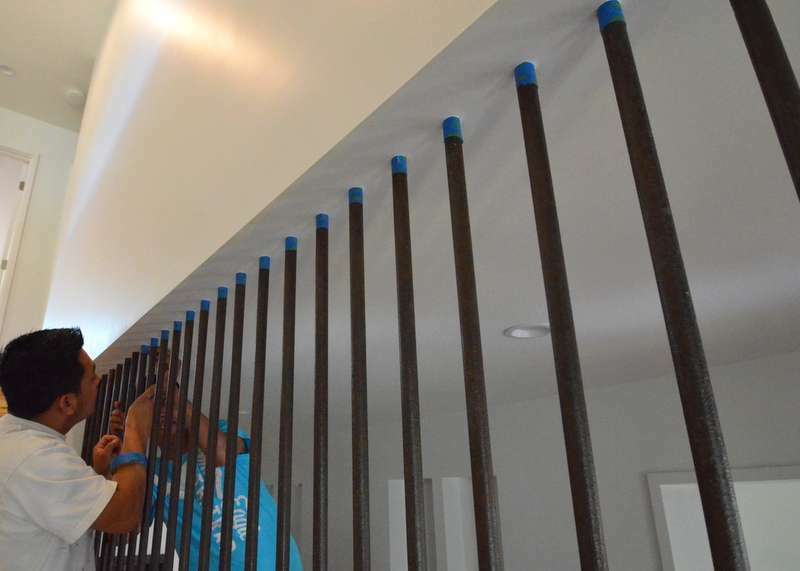 The painters continue to polish off the house, finishing off the ceiling where the balusters are inserted through the drywall into lumber framing. 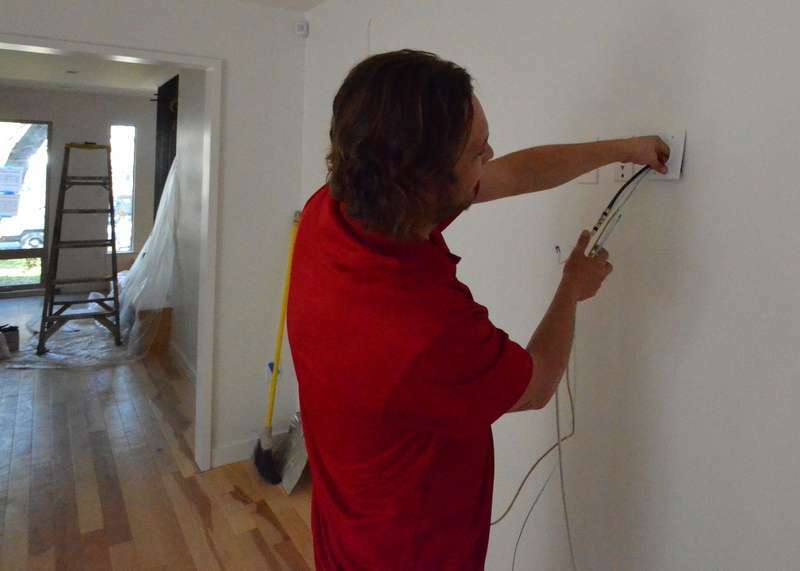 Tyler from Granite Security installs a network wall plate at the TV wall in the family room. Odell cuts open the back panel of the shelf end of the island, to install an electrical box for the network ports. 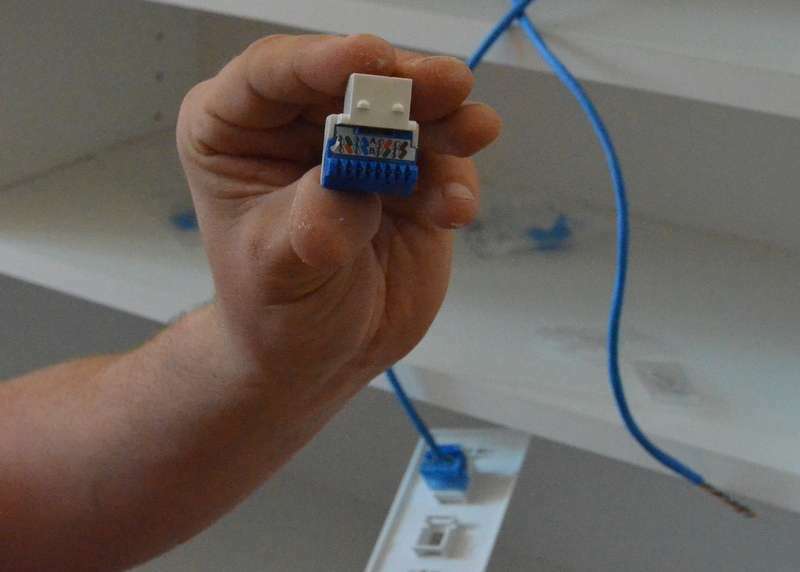 With Odell done, Tyler snaked the pre-wired Ethernet cable into the new electrical box and punched the wires to the connector. 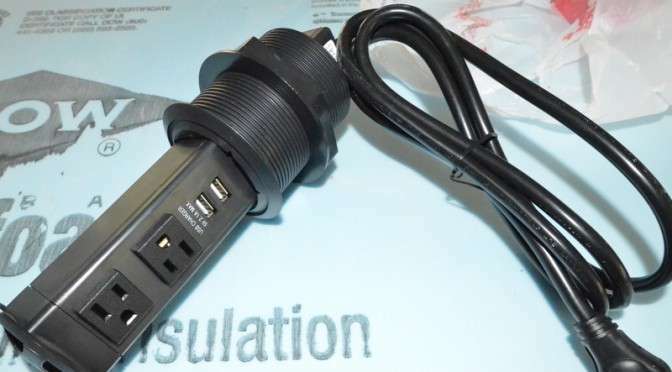 The connectors on the plug are color coded and labeled, making it easy to match the proper wire. Peter and Shane installed the tall vertical pull inside and out on the front door, and the deadbolt, and the latches. Steven is traveling — Barcelona for ShowStoppers @ Mobile World Congress. Jacquela takes over the remodel. She met Saturday morning at Emerald Hill with Shane and Peter, the carpenters. Together, they reconfigured the deadbolt on the kitchen side door and the front door — picking up an idea proposed during the week by Steven: Shifting the keypad/deadbolt to the kitchen-side door, taking it off the front door; shifting the deadbolt from the kitchen-side door, instead to the front door. This cleans up the front door; Jacquela thought the keypad unit would be too big and overwhelming and ugly for the front door. Shane shows the approximate mounting locations for the front-door deadbolt and extended vertical pull. As busy as yesterday — painters, carpenters, electricians, plumbers, team Ranserve, garage door installers — today was quiet. One painter working inside Emerald Hill. Steven cleaned up a pile of lumber at the back of the new garage, swept the floor clean, assembled plastic shelving, as preparation for moving boxes. 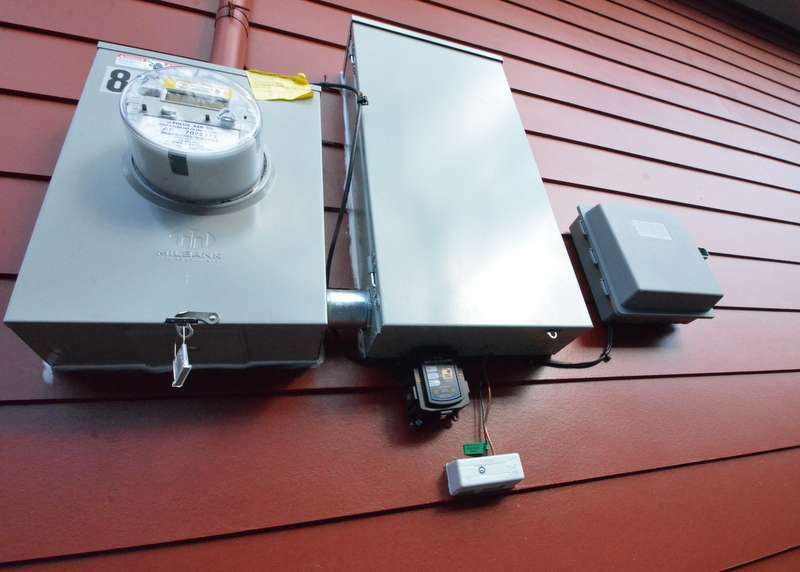 He installed LED lights to the outdoor motion detectors and garage motors. Delivered a supply of shelf liner to the pantry for Jacquela’s kitchen. Found a ding in the glass globe of the ceiling fan in the family room, tagging it with blue tape. The house was quiet. No radios playing. No nail guns firing. No bodies dancing around each other. It’s a preview of what it might be like for Steven to be home, working in the office, with everyone gone. Above, yesterday, Shane and Peter installed the massive door stops at the back and kitchen side doors. We need these to ensure the doors don’t slam into cabinets. 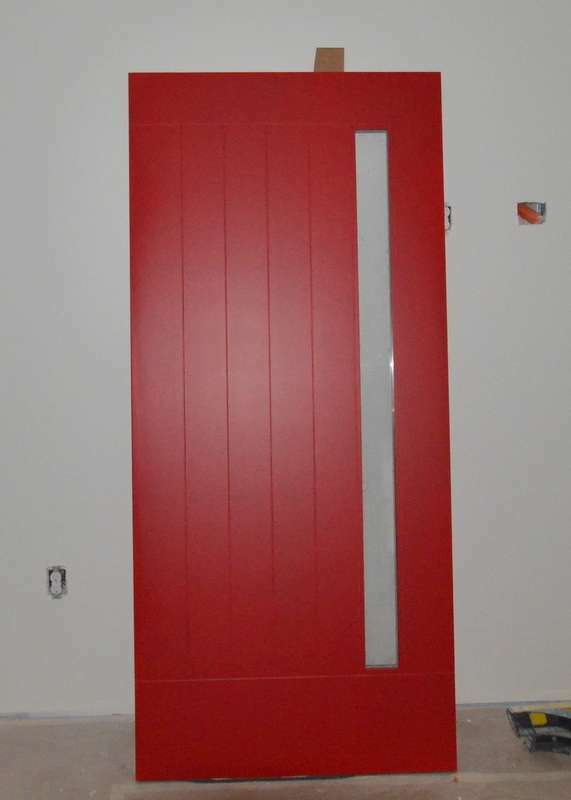 Speaking of doors, here’s the front door, test fitted by Shane and Peter — Jacquela’s red. An empty house with electricity switched on for less than 24 hours is a place to experiment. Steven worked the kitchen light switches for the first time. Seven six-inch cool-white LEDs arrayed in a U-shaped pattern over the aisles of the kitchen — one of the seven not visible in this photo. Plus the straight line of four four-inch warmer white LEDs over the island — Aldebaran, Regulus, Antares and Fomalhaut. 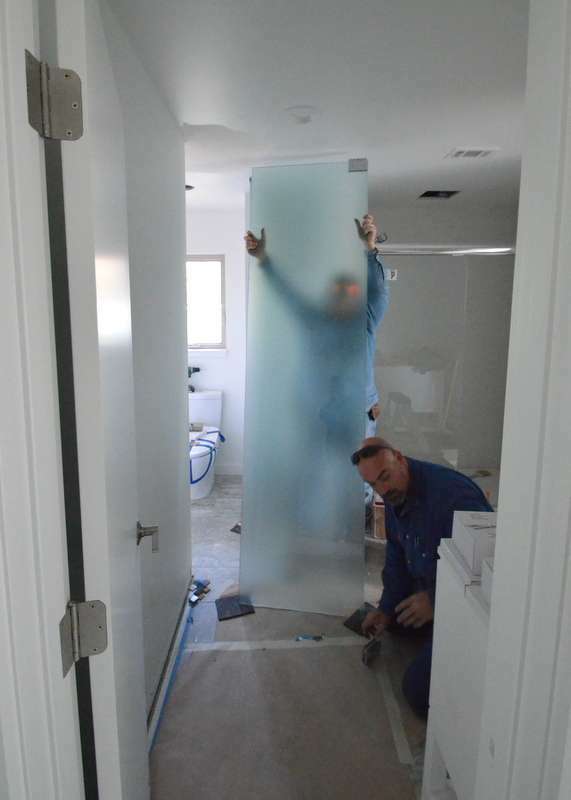 Billy and Chris arrived today from Binswanger Glass to install the glass doors in bath 2 and the master bath. They were not completely successful. 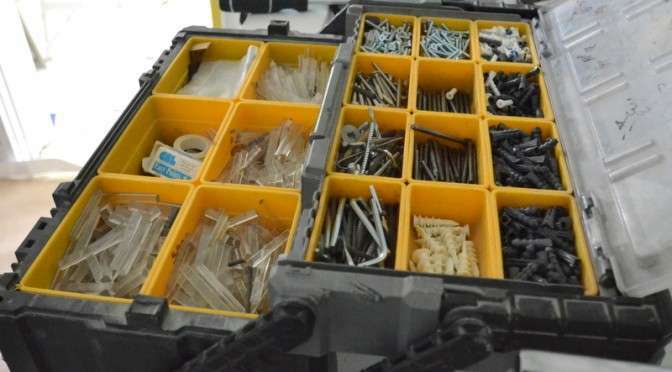 Above, a toolbox full of parts needed to install glass shower and bath doors. 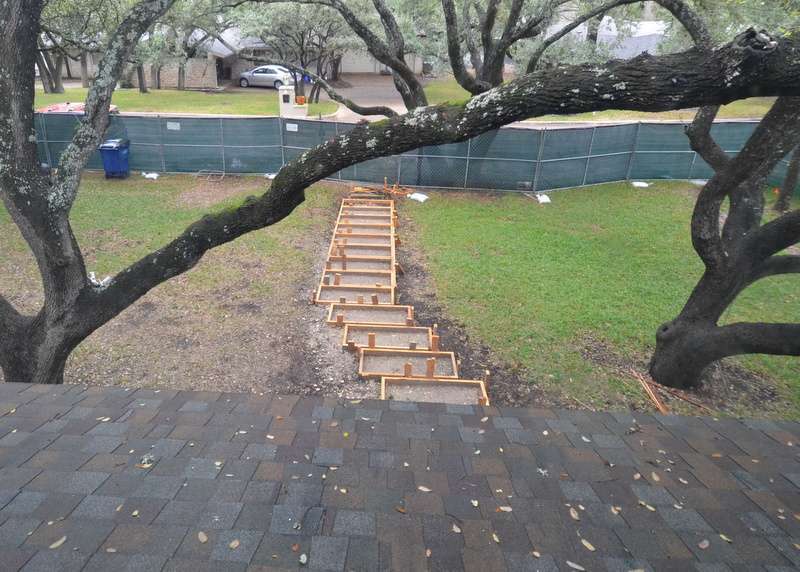 Billy and Chris also deployed drills, bits, shims, aluminum, a table saw, a framing square, protective pads, ladders — and a deliberate pace that proves they’ve done this for 12 years, speaking in shorthand. 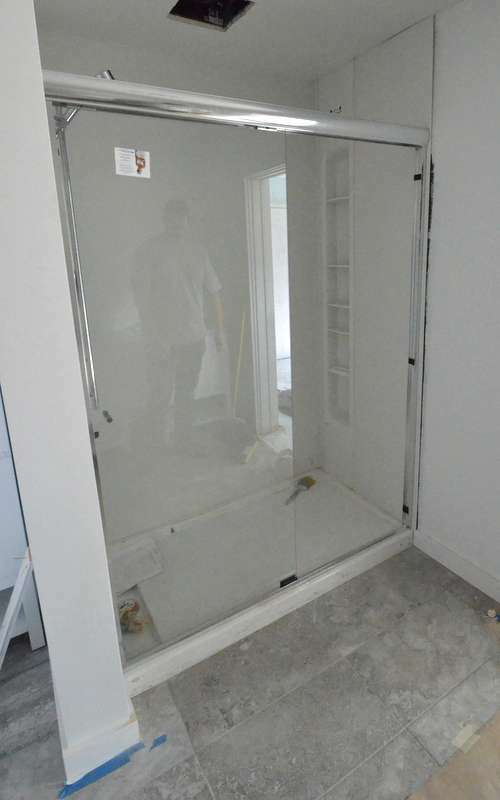 For the first project, Billy and Chris installed the shower frame for Jadin’s shower — and one of two sliding glass doors. 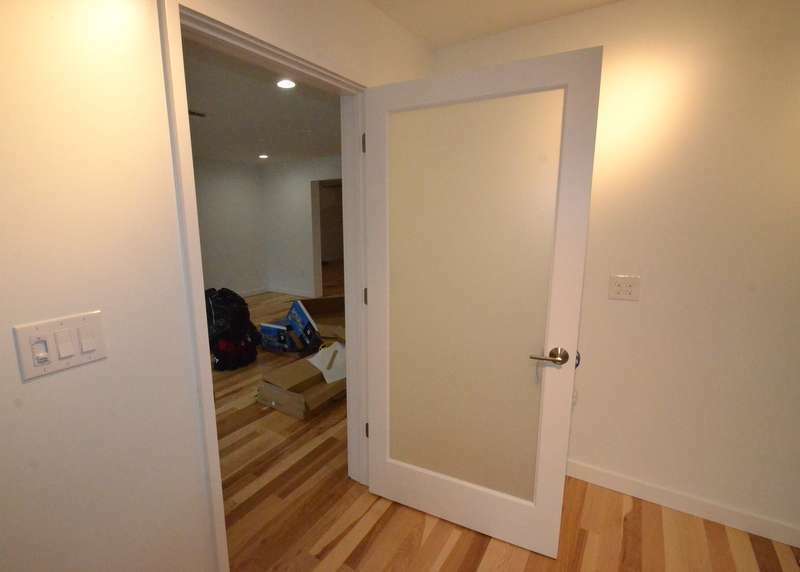 According to Chris, the second sliding door was cut too large and the mounting holes were drilled in the wrong location. They ordered a replacement. It will take about a week to arrive, according to Chris. 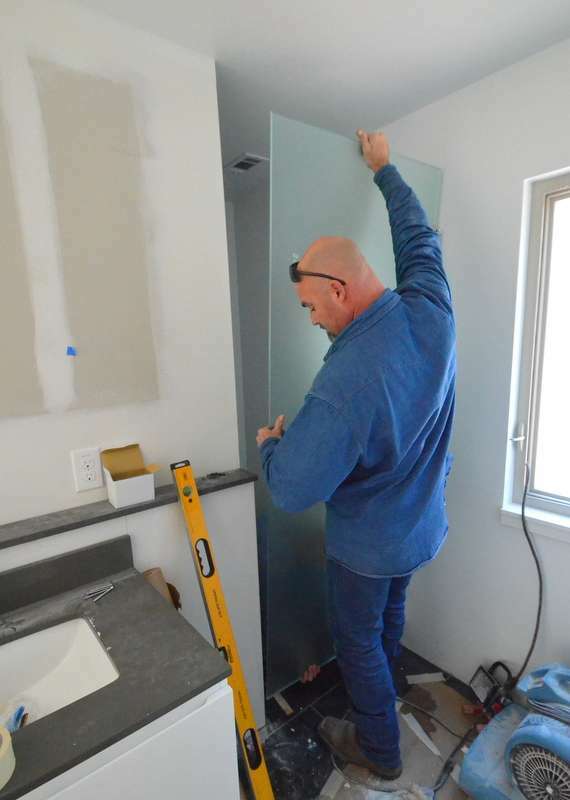 Chris attempts to lever into place the frosted and tempered glass door to the water closet in the master bath. Billy is inside the water closet working the bottom of the door into position. They discover that the glass is about 1/4 inch too wide; it was measured incorrectly. Billy, left, and Chris, right, walk the oversized glass door out of position. After this, they measured the passage several times, using several tape measures, to confirm the glass is 1/4-inch too wide. They marked the correct widths on the glass door, carried it downstairs and out to the truck to take away. 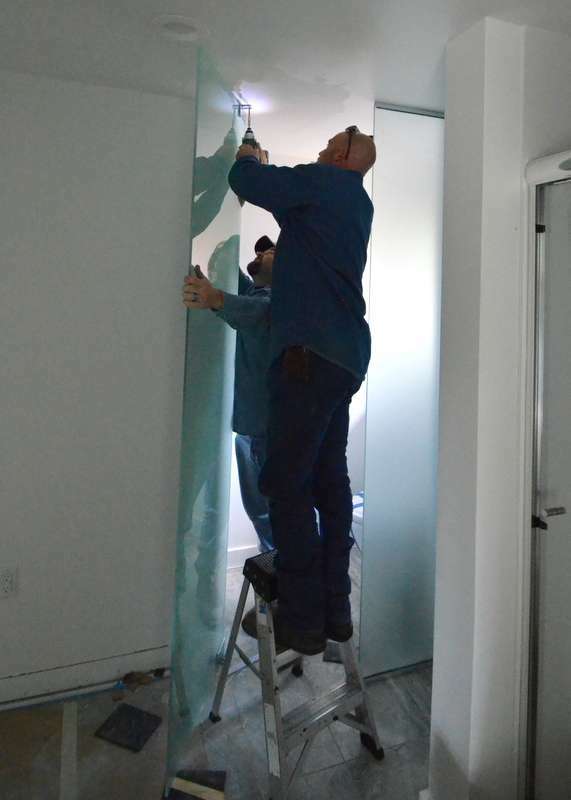 Because the glass is frosted and tempered, it cannot be trimmed or cut to proper size. They order a replacement. Chris says it will take about a week to arrive. 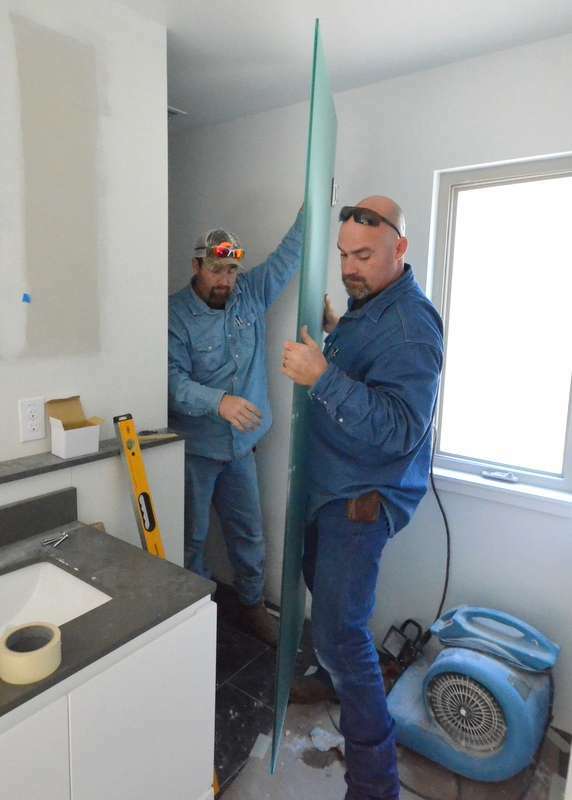 Back downstairs in bath 2, Jadin’s bath, Billy, left, and Chris, right, meet with more success installing the glass panel and door that enclose the water closet. Billy braces the glass door while Chris collects shims and screws. They screw the pivot into the blocking behind the drywall. Here’s the door, left, and panel, mounted. 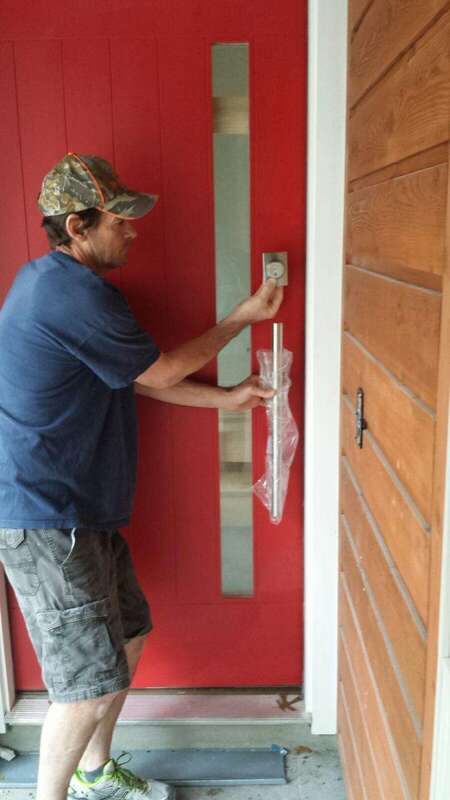 Ron Dahlke holds the oversized door pull about the height we decided to mount it. The lower blue tape is approximately 36 inches up from the bottom of the door — standard height for a door handle. The upper blue tape is about 54 inches up from the bottom. The door pull looks and functions better in this location. 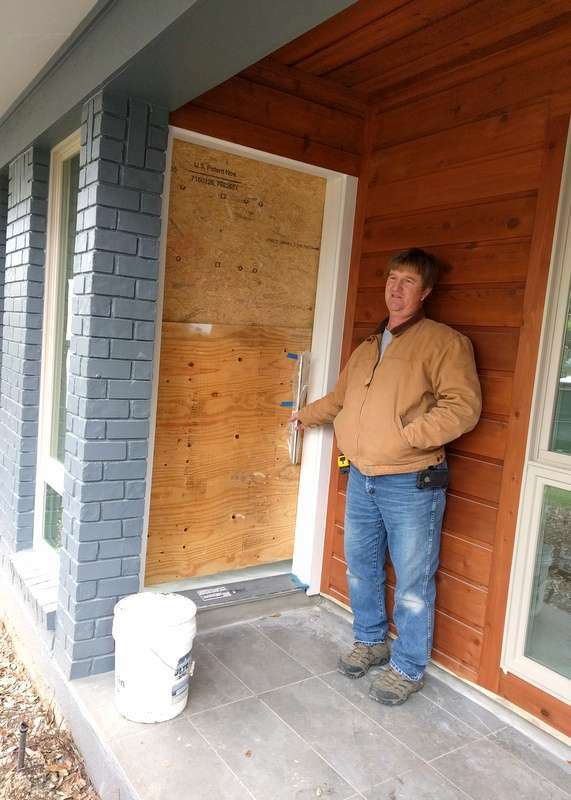 Not including earlier discussions, Ron and Steven, with help from carpenters Shane and Peter, debated what size door strike we need at which door — and where to install the oversized pull and smart deadbolt system on the front door. Why? Working with architect Brett, Steven and Jacquela opted months ago for oversized trim around the doors. 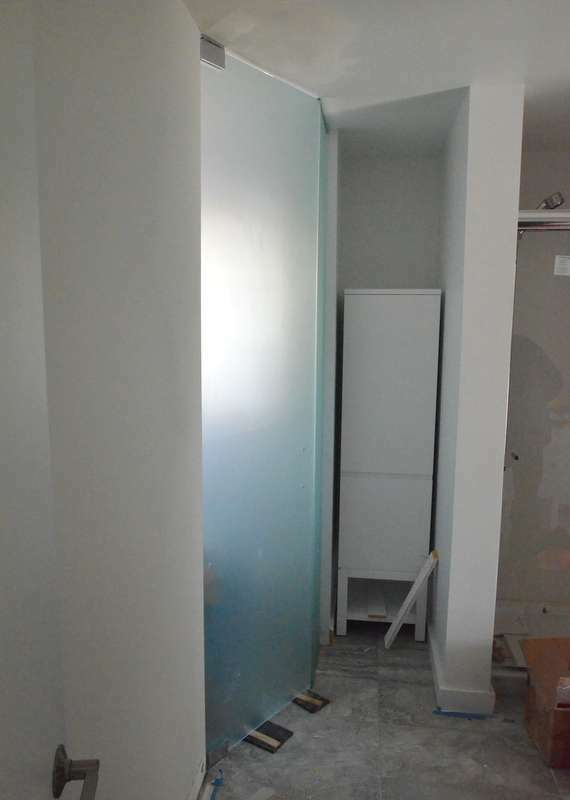 It’s not wide, but it is deep — standing more than one inch proud of the drywall. 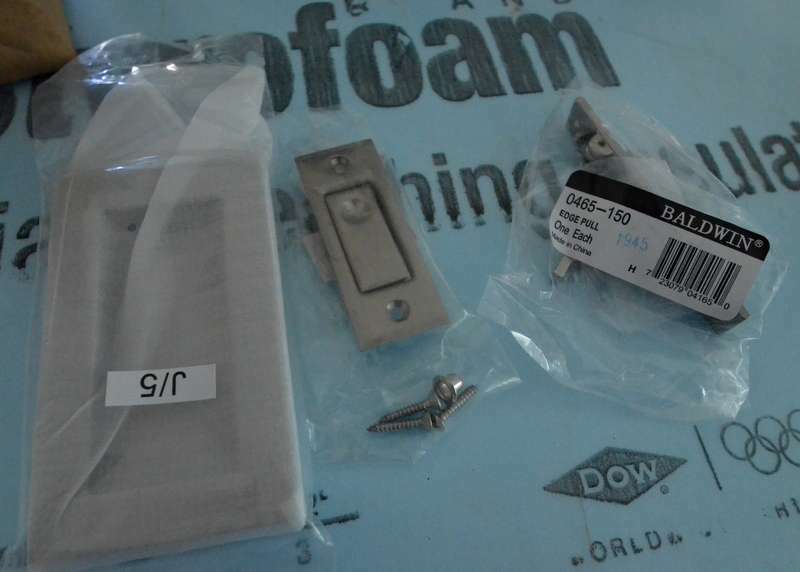 That aesthetic decision now cascades into a rude realization — standard-sized strike plates are not wide enough to protect the trim when the latch bolt slides across the painted trim. The bolt leaves a trail across the paint. With Shane’s help, we sized the kitchen side door for strike plate 2.25 inches tall by 3 inches wide. Standard width is more like one inch. 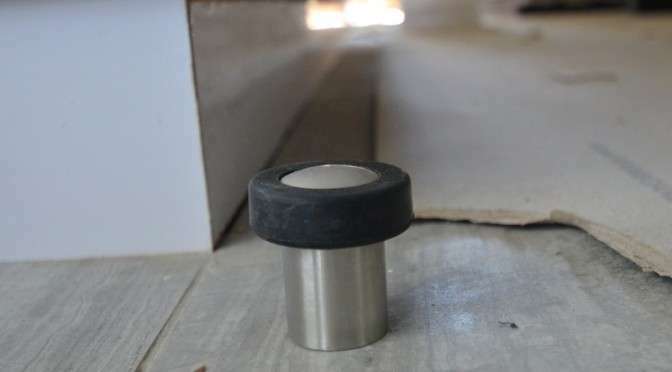 All the other interior and exterior doors — with the exception of the front door — need strike plates 2.25 inches tall by 2.5 inches wide. 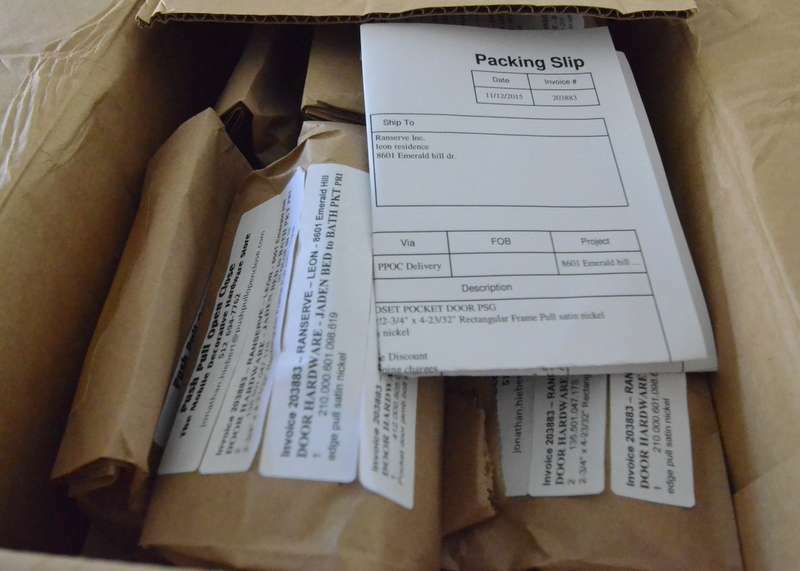 Steven shopped and ordered these online from Amazon. 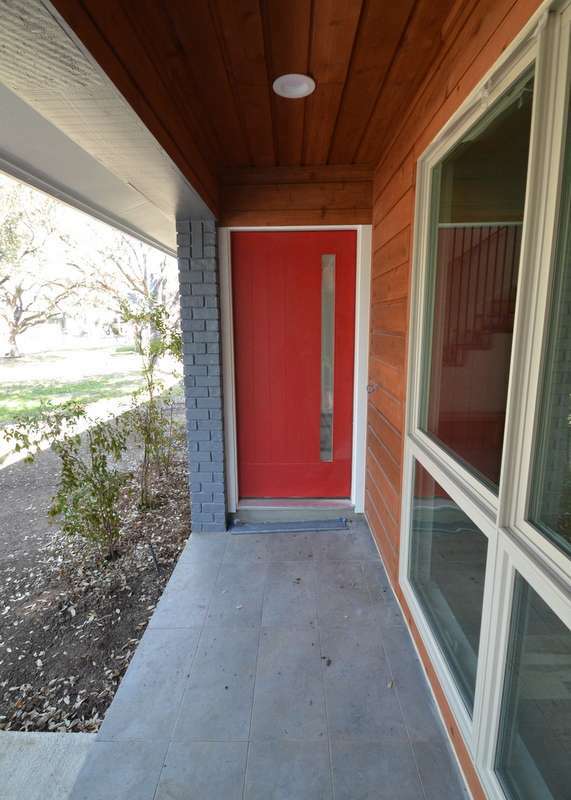 The front door is a different conundrum. According to Shane, the handle on a front door is normally mounted 36 inches up from the bottom of the door. If we mount the oversized pull at that height on the door, the pull will appear way too low, located properly only for very short people. We debated different heights for a while, shifting the pull up and down and calculating where to put the smart deadbolt above it. We decided that the top of the pull should be 54 inches up from the bottom of the door. Ron wrote this decision down. About three hours later, Ron called Steven to note that we forgot to compute into the 54 inches the fact that there is a step up from the porch to the front door — about seven inches. Today, we used blue painter’s tape to mock up the potential positions on the OSB sheets that currently cover the front door. One at 36 inches, one at 54 inches. 54 inches is where your hand meets the pull comfortably. The smart deadbolt mounts a short reach higher, at just about eye height for adults. Jadin is already nearly as tall as Mom and Dad — so that height is going to work just fine. Now it’s up to Shane and Peter to drill holes in the door to mount the hardware. Every small decision cascades into many more decisions that are complicated, time consuming, expensive, surprises to even experienced carpenters and builders, surprises that Steven could not anticipate or imagine. Every cascading decision comes with multiple complexities. Take a deep breath. Dive in. Talk it through. As many times as necessary. Use tape for mockups. Get as many hands and brains involved as necessary. Solve the puzzle. And the next puzzle. And the puzzles just don’t stop arriving. We’re back in Austin. Jacquela and Steven toured Emerald Hill with Hilary, older sister of Jadin’s friend Kara — checking in quickly to see what we missed while traveling in California. 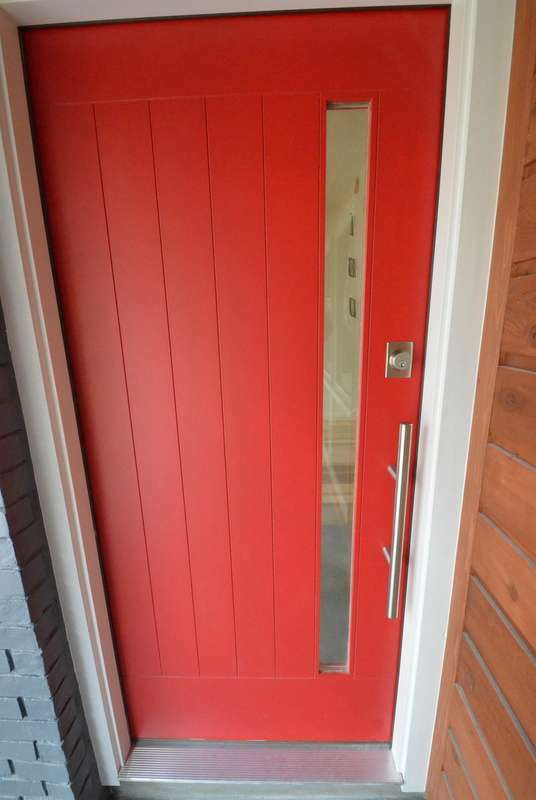 The front door is VERY red. Painted the color that Jacquela selected. 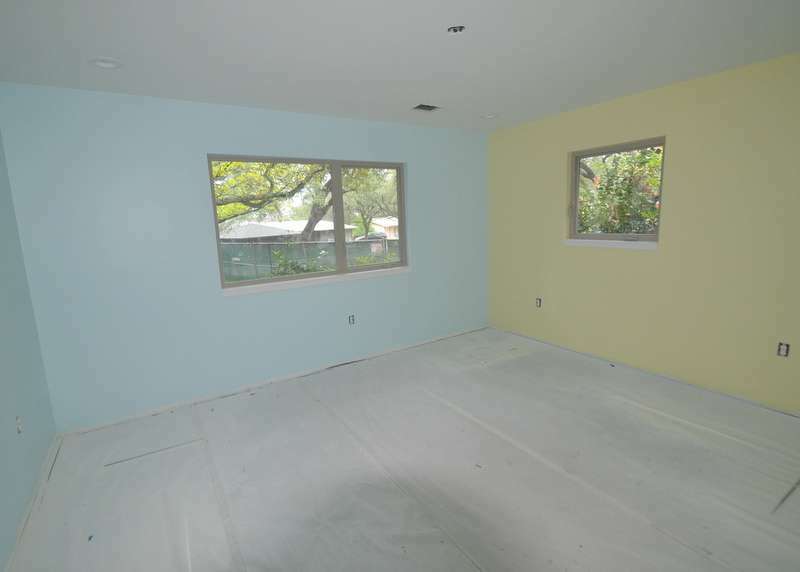 The yellow and blue paints that Jadin selected for her bedroom are up on the walls for the first time. 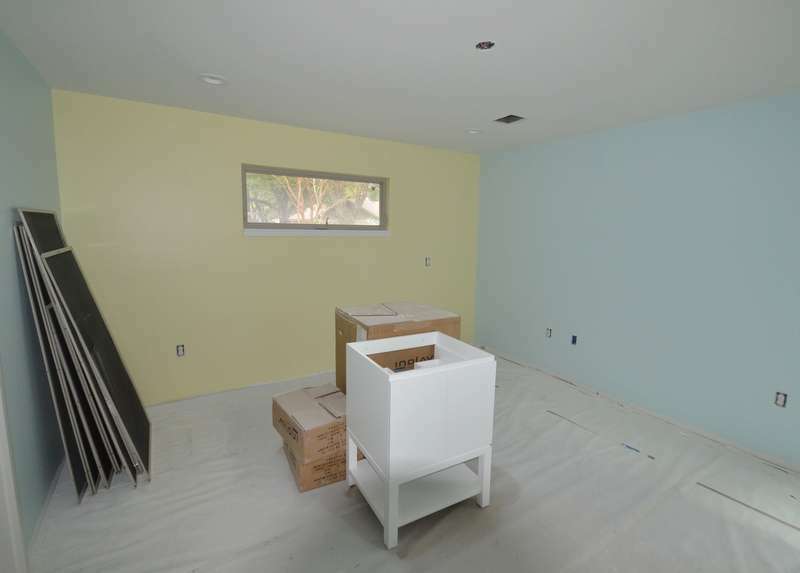 And the paint selections carry over into bedroom 1 at the front of the house. Forms for the front walk now extend to the street. 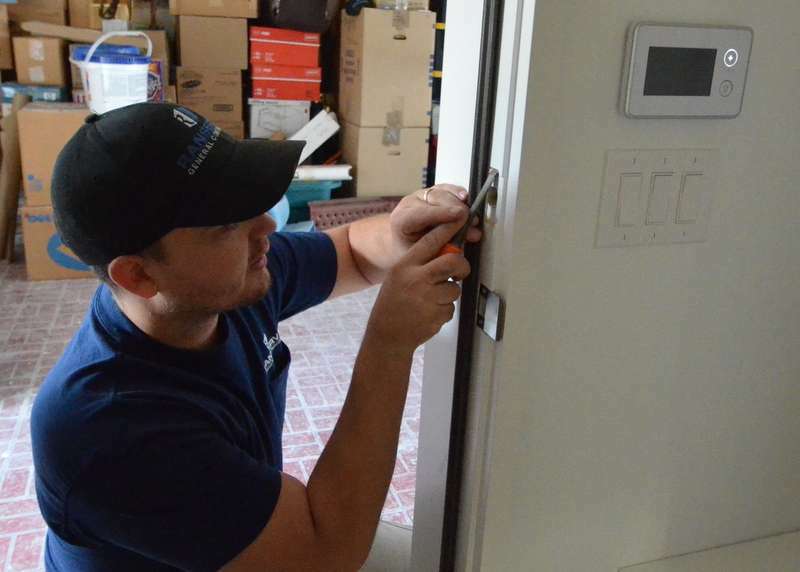 Steven took delivery today of more Schlage locksets purchased from Amazon at nearly 40 percent savings over the “big box” stores. Everything should now be on site in preparation for installation. Ron Dahlke from Ranserve opened up doors and drawers at Emerald Hill to surprise Steven with several other deliveries. Above, this device from Hafele features two power outlets and two USB charging ports. 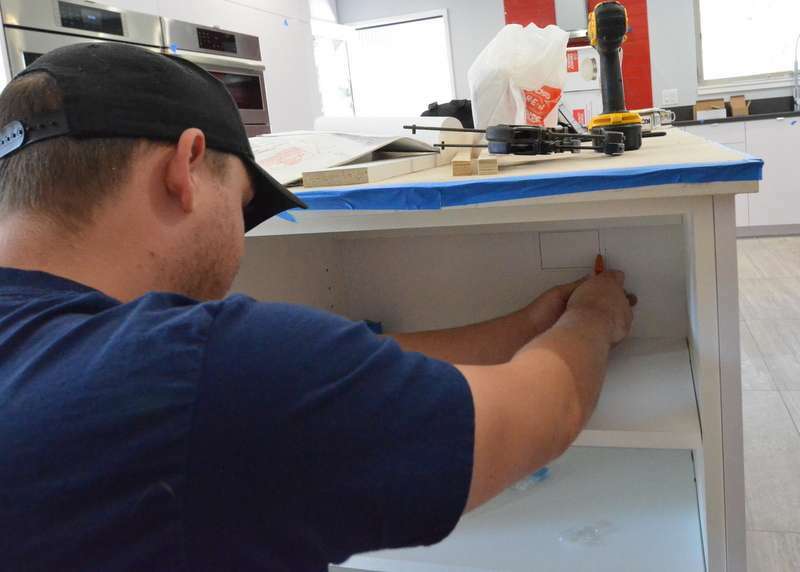 It will be installed into the countertop of the island, to power appliances and charge devices. It pops up when needed, disappears below the island countertop when idle. Cool. Suggested by Aaron at Central Texas Custom Cabinets. These are the big pulls for the front door — one for exterior, one for interior — from Sugatsone, delivered by Jonathan at Push Pull Open Close. They look small in the photo, but they are beefy, substantial, heavy. Jonathan at Push Pull Open Close also delivered a small carton packed with brown paper bags, each one labeled. Inside each bag is one set of hardware to open, close and latch each pocket door. Steven opened one of the brown paper bags. Inside is, yes, the pocket door hardware that Jacquela and Steven specced.